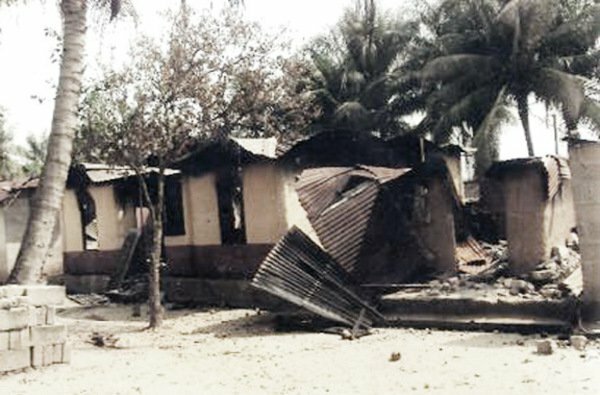 Victims of the recent communal clash in Cross River State have recounted their losses. Scores of people were reported dead while several others were said to have been injured as well as others declared missing..
DAILY POST gathered that over 21 high-class houses were razed down, three cars (One hi-lux, one 18 passenger bus and one car) and one motorcycle burnt. It was also gathered that six persons were reported dead while several others sustained various degrees of injuries. The Village Head of Usumutong and Paramount Ruler of Abi, HRM Oval Solomon Osim Edward told our correspondent that “The situation is calm. “We have soldiers on ground. I have no house again. I don’t know when I will be able to put such building again in this life. “I am somewhere in a one-room apartment with my wife. We are looking at the report government would write. Over 20 houses have been burnt and six death recorded,” he said. The Chairman of Promotion of Peace and Conflict Settlement, an NGO, Mr Wisdom Usani said, “I recorded 21 houses razed down, three cars (One hilux, one 18 passenger bus and a car) and a motorcycle were burnt” he stated. Mr Usani said Air vice Marshal rtd, Prof. Osim, former Chairman of Abi Local Government Area, former secretary to Nigerian Ambassador to South Africa, Late Sunday Edu and Late Chief Effame Osim Onya’s houses were all burnt and destroyed. DAILY POST gathered that the Abi Local Government Area embroiled with communal clashes have personalities such as Speaker of the Cross River State House of Assembly, John Gaul Lebo, former Chief of Staff to former Governor Liyel Imoke, Alex Egbona. Others are former Governor, Liyel Imoke, former State Security Adviser to former Governor Imoke, Rekpene Bassey and host of other personalities in the state.